Purdue has led the way in smallholder farmer grain storage over the past 10 years with the Purdue Improved Crop Storage (PICS) project funded by the Bill & Melinda Gates Foundation and other donors. The PICS technology is a triple layer sealed plastic bag that cuts off the oxygen supply to create hermetic conditions, thereby eliminating insect damage in storage of dry grain. This low-cost technology was developed and initially disseminated for cowpea grain, but it has more recently been found effective for all types of grain and even other products. PICS bags allow farmers to store their grain without the use of insecticides, and provides them the flexibility to sell when prices are high, while having chemical-free high quality food for their families throughout the year. 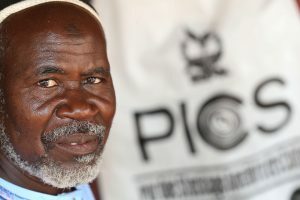 The PICS program originally involved 10 countries in West and Central Africa, but has been expanded to Eastern and Southern Africa and to South Asia. The success of the technology has been shown by it transfer to farmers in >40,000 villages in Sub-Saharan Africa, the training of >2 million farmers on use of the bags, and by the private industry developing to manufacture and sell PICS bags in >23 countries in Africa and Asia.